6) If it ain't 5 times or 3, I gotta go with 4 times we hear/see the cattle prod used. "You can get it off the ground!!!" How about just twice? Once on Blake and once on Alta Two..? 1: Publicity photo question! : This series crew shot, they wore costumes not actually used in the episode/set they are on . *Clue 1* The set was only used once in the third series. 2: This resistance leader wore a bum-bag round his waist - very fetching . Who was it? 4: "Pull away Avon, you are too close" To close to what? 7: How many bombs did Gan plant on Centero? 4. The asteroid in Stardrive? The set is the Mellanby hideout from "Aftermath" but those definitely aren't the costumes from that episode. 6. Ummm... B, 9 times? 3) "I'll remind you" in that after Blake remarked on Avon saving his life, Avon said he'd remind him at the right time. 1: This one's death scene was a little OTT! He did have an audience though. 3: This one called Tarrant "friend". BP When did Tarrant call someone "friend" after knocking him out. 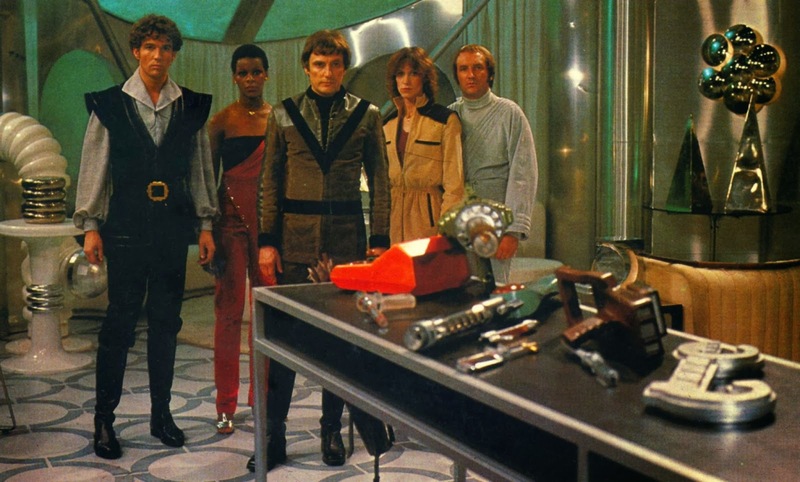 4: What did Servalan do in "Gold" to Avon that Soolin did to him in "Rescue"? 5: True or false. The colouring on the 4th series B7 opening/closing credit logo is different? 6: "And if I got past it, where could I go"? BP if you can say what planet this one was leaving? 7: Servalan thought that this one was "a difficult man"